Mukene A woman sells mukene at a landing site near Jinja, Uganda. This edible minnow is known as dagaa in Tanzania and omena in Kenya. Photo by Sarah Glaser. Conflict Heat Map Heat map of violent conflict events around Lake Victoria, 1997-2010. Data points represent battles or change of territory in an armed conflict between a national government and an armed insurgent group, or conflicts between armed non-state militias. Inset shows detail of Lake Victoria. Data are from the Armed Conflict Location and Event (ACLED) dataset (Raleigh et al., 2010). Research Team The research team at the National Fisheries Resources Research Institute in Jinja, Uganda. From L: W&M GIS instructor John Holden; W&M undergraduates Alyssa Luisi, Colleen Devlin, and Catherine Mahoney; VIMS professor Sarah Glaser, and W&M professor Cullen Hendrix. Photo by Emmanuel Bibo. Fishing boats Fishing boats in Buluba village on the shores of Lake Victoria. Photo by Sarah Glaser. Fishing Two fisherman cast a net into Lake Victoria. Photo by Sarah Glaser. Coursework From L: Sarah Glaser, Nyatugonza Viany, and Bwambale Mbilingi discuss socioeconomics during a break in the GIS course. Photo by Cullen Hendrix. Fishing Village A typical small fishing village on the shores of Lake Victoria. Photo by Sarah Glaser. 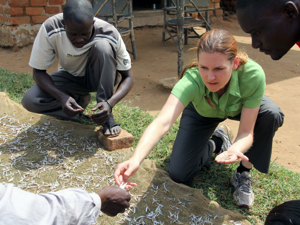 Dr. Sarah Glaser, a visiting professor at the Virginia Institute of Marine Science, has received a two-year, $243,000 grant from the National Science Foundation to continue her study of the links between armed conflict and fishery resources in East Africa’s Lake Victoria basin. 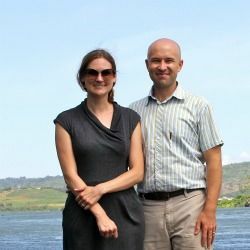 Glaser, who has a dual appointment in the Department of Fishery Science at VIMS and the Department of Biology at William and Mary, will team on the project with W&M’s Cullen Hendrix, an assistant professor of international relations; Leslie Kaufman of Boston University, an expert in the ecology of Lake Victoria’s fishes; and several W&M undergraduate and graduate students. The project includes a unique partnership with colleagues in Uganda to help establish a Geographic Information Systems center that had been identified as a pressing need by scientists in the country’s National Fisheries Resources Research Institute. Center partners will place fisheries data into a geographic context, thus facilitating comparisons with existing conflict data and maps developed by the Uppsala Conflict Data Project, the Armed Conflict Location and Event Dataset, and the Social Conflict in Africa Database. Lake Victoria, the world’s second-largest body of freshwater, lies in East Africa at the intersection of Kenya, Tanzania, and Uganda, with its watershed extending into Rwanda, Burundi, and the Democratic Republic of the Congo. All these countries, except Tanzania, have experienced recent or ongoing conflicts whose impacts have directly affected the food security of the area’s 40-million people, as well as fishing patterns among local villagers. The NSF-funded project builds on Hendrix and Glaser’s groundbreaking study of the global interplay between conflict and fisheries. 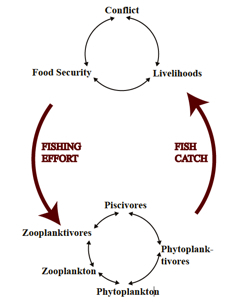 That study, which earned a Journal of Peace Research “Article of the Year Award” in 2011, showed a clear connection between conflict intensity and a reduction in reported fish landings. Though the link between conflict intensity and reduced landings is clear on a global basis, the links between conflict and fisheries around Lake Victoria are more complex. Indeed, recent catch data show that the lake’s total landings—from Kenya, Tanzania, and Uganda combined—were actually on the upswing through some of the most intense periods of fighting in the early 2000s. “That’s what we’re interested in,” says Glaser, “figuring out what’s really going on in and around the lake." Glaser will focus on the lake’s ecosystem and fisheries, while Hendrix focuses on economic and social factors. “What we’re trying to do is take all of this stuff—food prices, labor-market dynamics, violence in the region—and understand it through the framework of Coupled Natural and Human Systems analysis,“ says Hendrix. “We want to break down the landings data by location and species, and to better understand how the influx of refugees from the conflict in northern Uganda is affecting the fishery,” adds Glaser. That conflict—driven by Joseph Kony and his Lord’s Resistance Army—forced nearly two million Ugandans into southern areas of the country around Lake Victoria. The research team will explore the feedbacks between this human influx and local fisheries by carefully analyzing and mapping data on everything from fishing catch and effort to unemployment rates, income levels, and the price of fish in local and international markets. Another issue, she says, is that regional conflict might have fueled demand for a native minnow called mukene, which can be dried into jerky to feed both insurgents in the field and those fleeing the fighting. Anecdotal evidence suggests that this demand has driven up mukene prices in local markets, making it more difficult for villagers to buy this traditional source of protein. In an interesting twist, mukene populations have themselves grown in the lake during the last few decades due to the introduction of Nile perch, a non-native species that eats both catfish and cichlids—two native species that previously competed with mukene for food. Nile perch are not eaten locally, but provide an important source of income through exports to European markets. However, recent data show that the fishery for Nile perch is in decline. Some experts fear a crash in the coming decades. Such an event would raise an entirely new set of questions. “Our goals are to understand the interrelationships of ecological processes and human social-political processes,” says Hendrix. “If we do good science, good research, and work through the collaborative process, we can have a positive impact on natural-resource management that crucially can affect the lives and nutrition of more than 40 million people."